Obafaiye Shem, the hilarious commandant of Lagos chapter of Nigerian Security and Civil Defence corps, NSCDC started this Oga at the top thing few weeks ago. Nigerian celebs are now buying into it. 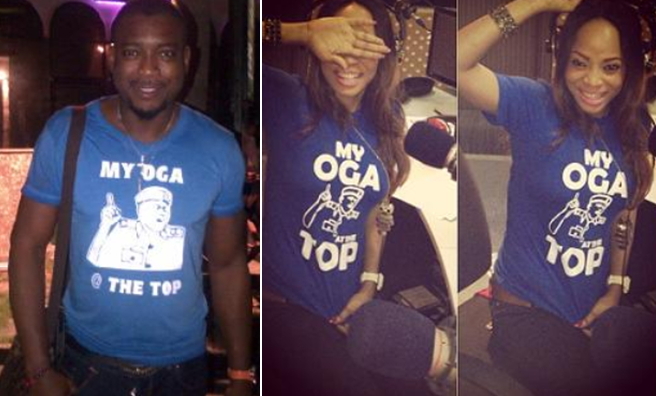 Actor Chidi Mokeme and radio presenter Toke Makinwa were spotted rocking the funny t-shirts made by smart Alaba boys. I hail those Alaba boys… Chai! dem get brain. i wonder y we keep botherng ourself wt dis my oga at d top mater wen d morons elected at d senate rejected d bill dat wl pay jobles nigar graduate 20,000 monthly. Na wa for dis our con3 oooo. What a disgrace to naija public office, my oga @ de top, wat does it entails? Onye egwu na turn by turn. Na so igbo pple talk am. Wey presido wife do her own mistake na so wey laf,coment,etc. Now na commandant turn na. Nigerians na sharp pple u know?